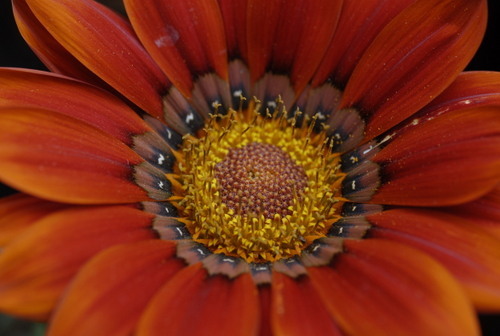 Gazanias are little rays of sunshine with their vivid yellow and orange faces. Stalwarts in any African summer garden, they are the plant that just keeps on giving without much in return. Gazania rigens are native to Southern Africa, although they have now been naturalised in Australia, New Zealand, the coastal Mediterranean countries and parts of America. Gazanias belong to one of the most economically important families, Asteraceae, which includes import food crops as well as garden favourites such as Zinnias, Dahlias and Marigolds to name a few. 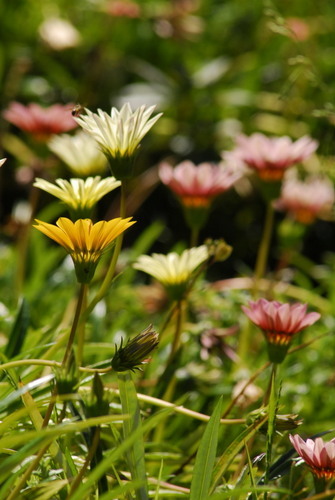 Gazanias are perennial plants and can be easily overwintered in milder climates. In frost regions they are grown and used as an annual. 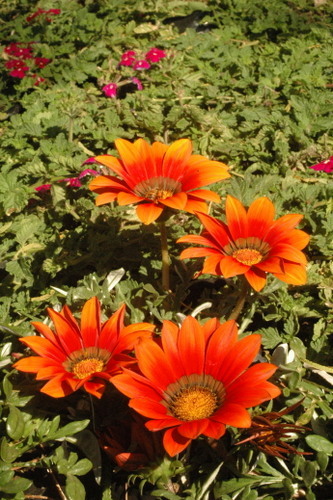 The leaves of the Gazania are alternately arranged and are densely clustered along the stems. They are variable in shape and appearance. Most commonly they are lance shaped but they can also be spoon shaped. Some leaves are smooth edged and others are indented. Leaf colour varies from light to dark green although some varieties have grey leaves. The upper surface of leaf is generally hairless but the underside of the leaf is densely covered in fine white hairs. Hairy stems rise above the nest of leaves to show off a single, daisy like flower. The flowers of the Gazania are large and extravagant. Simple in shape, the petals are narrowly oval and are arranged around a central disc. The central disc is usually dark in colour creating the illusion of a ring at the base of the brightly coloured petals. Some clear coloured varieties do not have this dark central ring. The most common colours in the Gazania palette are orange and yellow however through selective breeding you will also find other bright colours such as red, rose, violet, bronze, white as well as bicolours. These plants are versatile and can be used en masse in the flower beds as well as containers. The creeping varieties make this an ideal choice for groundcover or hanging baskets. Plant Gazanias in full sun. The opening and closing of the flower is a direct result of light intensity. For best results add compost to the soil before planting. This is a waterwise plant and does not require a lot of water, however the plant will flower more prolifically if not subjected to drought conditions. Deadheading will also contribute to continuous flowering. Young seedlings can be pinched to encourage side branching which will result in a bushier, sturdier plant. Feed monthly with a water soluble multifeed. Gazanias have adapted themselves well to ensure maximum proliferation. Their brightly coloured flowers attract a host of pollinating insects and yet they are not threatened by common garden pests and diseases. The seeds are covered in long, straight hairs allowing for efficient wind dispersal. The plants are very drought tolerant and do not require a particularly organically rich soil which means they can grow almost anywhere. Gazanias are good value for money. Coupled with their hardiness these plants will flower for most of the year and they reproduce at a fast rate – the flower bed will be full in no time at all.